THANKS! Just placed my order! Haha, thanks. Just trying to be helpful. Admittedly, it doesn't take much to past the standard of their email notification service. Anyone who has ever posted in here about an available figure even once, is already ahead of that curve lol. Weather was in the low 50s this morning. Currently were in the mid 70s, i even took the roof panels off this afternoon and drive to work. However LIVING in snow and that constant feeling of cold GTFOH heres the temp here currently at my location. Man thats warm over there at the blue oyster. This is the product of midnight boredom. Sorry for the mediocre photo. anyone else seeing this in stores ? i had actually READ about this and saw a pic before visiting a store and actually seeing it with my own eyes. it crossed my mind that it was some kind if "thing" that people were doing to be funny because...how could the head fall off that many figures.. Sometimes it's hard in cold climates. Being in big northern coastal cities does wear on me sometimes. 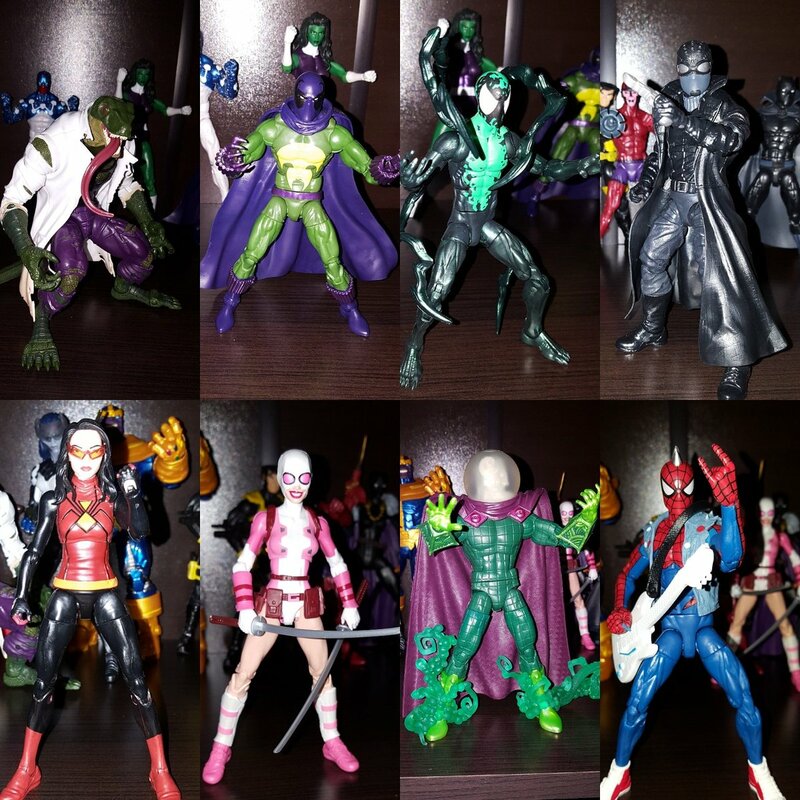 I know there are Marvel Legends to be had, but I decide it's too cold. So I let the scalpers obtain it. Nothing better than beating scalpers though. It gives me a sense of pride. As much as I like big cities, the hectic nature of everything wears on a person....at least to me. Well traveled and educated, I cannot really understand how the hustle and bustle does not wear people down? Taking a day off to go toy hunting and see what is up with all the TRU's and saying goodbyes and taking some photos in the process. I hear ya, sometimes, it's just too darn cold to go out. Speaking of TRU, I went to the one by my job yesterday and normally, it's fully stocked (granted, it's all peg warmers, but still). Yesterday, it was damn near barren. I grabbed the Classic Voltron Black Lion for myself but it was the only one they had. I got the Lizard wave in. I took some pictures. I'll post them later today. It's a decent wave. 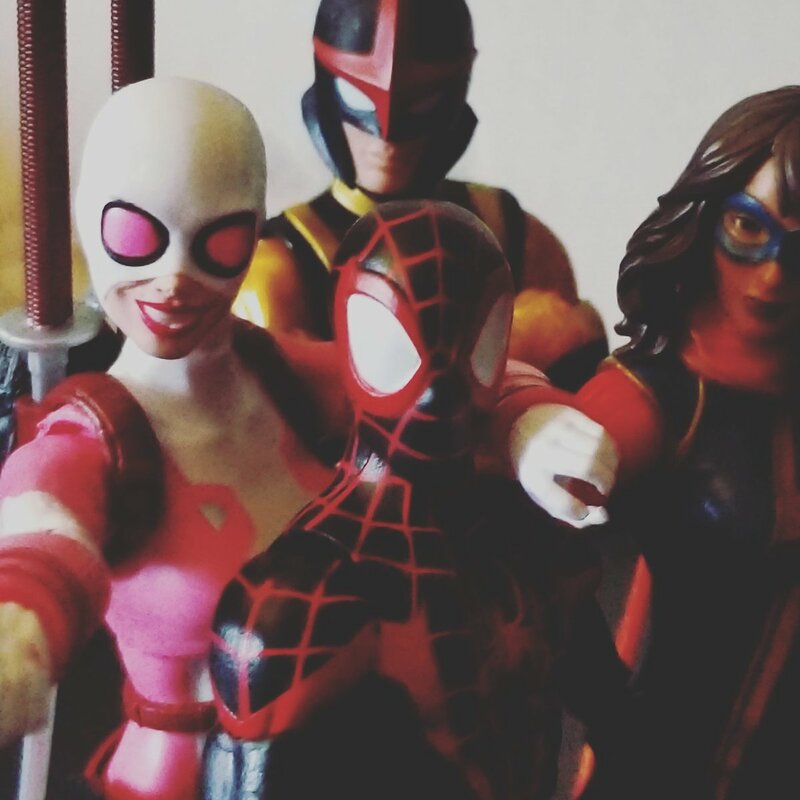 Just a Gwenpool selfie with her SBFFs*! Speaking of Vulture, has anyone had issues with the knees on their BAF Vulture? Lizard- I like him a lot better in person than I thought I would. Very happy with him. Prowler- I found him a few weeks ago. Fun to pose, but the cape is a little long. Solid otherwise. The one from this case is already going to a friend. Lasher- Same with Prowler, I found him a few weeks ago. I do have an extra one in package with BAF part if anyone is looking. He's cool but doesn't really stand out. As a Venom fan, I'm happy with more symbiotes. Spider-Man Noir- He's awsome. I like that they used the Ultimate/Movie Fury coat on the Ghost Rider body. I can't wait to find a second one to make a Modern Red Skull custom. Spider-Woman- Not a fan of this costume. This figure is just kind of there. Easy pass if you don't need the BAF. Gwenpool- The character doesn't do anything for me. Nice to have her I suppose and since I'm a completest on comic characters, I would have gotten her anyway. I just don't get the buzz around her. Mysterio- I got a white head one. He's awesome. I'm very happy with him. Spider Punk- As a radio DJ and a punk rock fan, this guy is my spirit animal. I'm in love with the look of him. He's easily my favorite of the bunch. I enjoyed the Spider Verse story and I was really hoping we'd get this guy. Very happy to see him made! Last edited by Spyne98; 03-14-2018 at 11:30 AM..
No, but honestly I built him, hung him up and haven’t really messed with him since, but I recall him being super tight, like I cracking paint fused joints tight when I posed him. Nothing on my MCU Vulture is wrong in the knees, mine has a tight left shoulder hinge though. Jesus, where is everyone getting their Spidey waves from? I've had mine preordered at Dorkside since it went up and still nothing. I stumbled onto mine at a targouge ( target ) on the next to last day of their "sale". 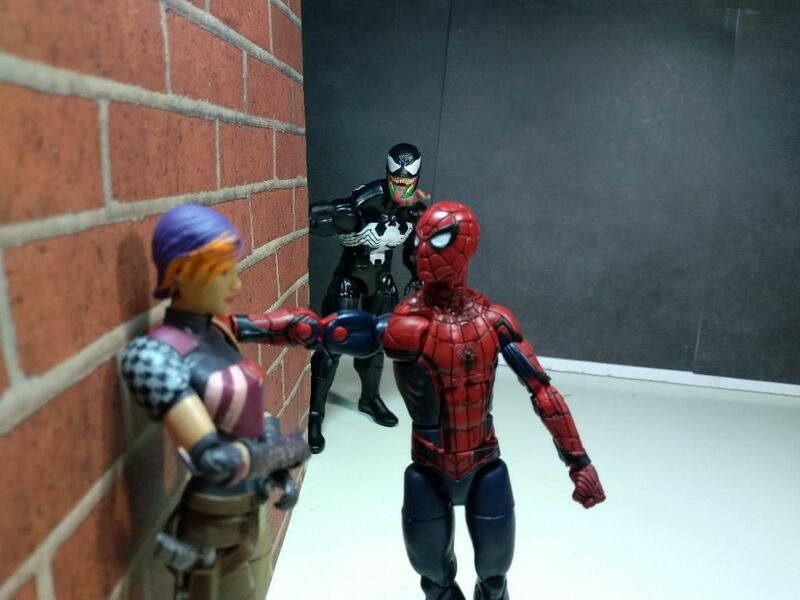 Last edited by Nitelife; 03-14-2018 at 01:25 PM..
Dude you have some real bad luck.. my spidey wave got sent to me almost 2 weeks or so ago from dorkside. 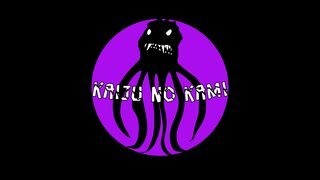 The action figure God's are not pleased with you..
Last edited by DarkToyLord; 03-14-2018 at 04:21 PM.. Roof panels you say...what kind of car? Weather blows around here so I have to live vicariously through others lol. That could be it and makes sense. I ordered Prowler, Cable, and the classic Deadpool, but they haven’t shipped yet. I’m not worried as I’m sure they will arrive some time. Plus I’ve just picked up some older figures on eBay that I really wanted. A 2014 jeep wrangler unlimited. Weather has been ideal lately for top off weather. In a few weeks to a month we'll have nothing but horrid heat and alot of rain til november. Let ne not forget to mention we start hurricane season in june.